The Einstuerzende Neubauten already exist for 25 years now. To celebrate this anniversary, the Berlin avantgarde industrial act embarked on a new tour. 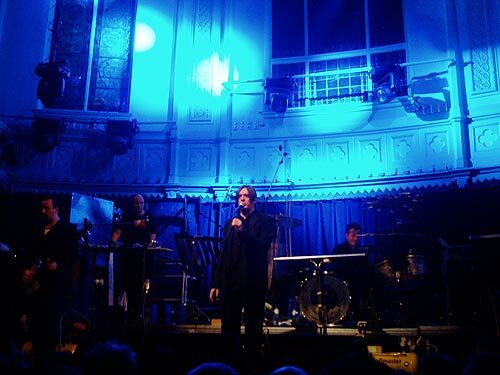 They played amongst others in Amsterdam’s Paradiso, where they did a great show. For this special occasion various Neubauten-classics were pulled out of the dust. They also brought along many of the (self-built) industrial instruments which they employed in the course of time. This meant metal tubes, plates, barrels, drills and other electrical tools and many other items from the scrapheap, assembled by sound inventor N.U. Unruh. 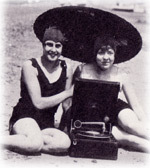 The roadies had to do some hard labour, because with each song new objects were brough to the stage. The six-piece band was in great shape, playing two sets of an hour, with a nice mix of old ‘hits’ (‘Yu-Gung’, ‘Z.N.S.’, ‘Haus der Luege’) and new work of their excellent latest album”Perpetuum Mobile”, like ‘Selbstportrait mit Kater’ and ‘Ein leichtes sauseln’. My favourites: the atmospheric, almost a capella ‘Salamandrina’ and the dynamic ‘Redukt’, going back and forth from loud to soft. The band seemed to be in a good mood. Guitarist gitarist Alexander Hacke and Blixa even did a few frivolous dances. Frontman Blixa Bargeld entertained the audience with some anecdotes about their past, telling about old songs he can hardly relate to nowadays, or songs that they were not able to play in the past because of lack of musical skills. Blixa dedicated ‘Yu-Gung’ to Dutch writer and Neubauten fan Karin Spaink(Fuetter Mein Ego), while ‘Haus der Luege’ was played (ironically) for the just deceased Pope. During ‘Was Is Ist’ the public gets the chance to particpate in some community singing, with the difficult refrain “Was ist ist/Was nicht ist ist m?glich/Nur was nicht ist ist möglich”. Bargeld only was rather annoyed during the concert with the sound of his monitor. He often looked violently at the sound engineer. Later I read that Blixa was a bit ill and could not turn up for the soundcheck. The concert was very intense, with an excellent combination of heavy percussive pieces and restrained poetic songs. A convincing proof that experimenting and beautiful music does not exclude each other. 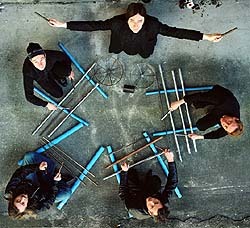 The Einst?rzende Neubauten proved that they are still of the few really special and creative bands. Their solid foundation is absolutely not in danger of collapsing yet, though Bargeld announced that their next tour will only be in a few years time.